Take a walk through our Interpretative Galleries and reflect on the stories and teachings of our ancestors and local Elders. 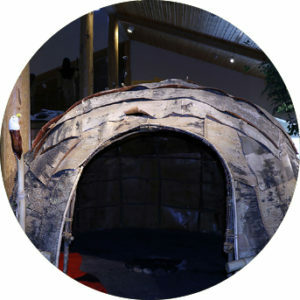 Our galleries lead you on a journey through time, where you experience oral histories and archaeological knowledge in the form of interactive displays and exhibits that teach you about Ojibway life and culture in the Rainy River area. This journey leads you from the more recent past, back to the earliest inhabitants of the region. Immerse yourself in the sights and sounds of life along Manidoo Ziibi while enjoying your guided or self-guided tour. The Interpretive Centre at Kay-Nah-Chi-Wah-Nung contains several different galleries that immerse visitors in the ways of life of the Anishnaabeg. Displays range from the story of Turtle Island, to the medicinal plants present at our site, and the importance of wild rice and sturgeon to our ancestors and our present community. The architecture of the Interpretive Centre reflects its natural surroundings. Having been built directly into the river bank, the Centre is barely visible from certain angles; blending in seamlessly with the landscape. The Centre serves as the cultural core of the community, a place for community members and visitors to gather to experience the rich history of Manidoo Ziibi. In addition to representing the history and traditional lifeways of the Ojibway, Kay-Nah-Chi-Wah-Nung plays host to community gatherings, staff meetings, holiday buffets, and other community events, allowing the community to continue their deep connection with the site.